My girlfriend and I were visiting a private cemetery just to investigate. We were both very startled after looking at some pictures I had taken off of my iPhone. 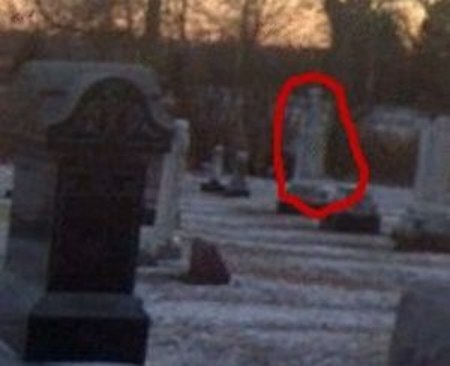 There seems to be an apparition of a woman praying towards the right of the photo. At first glance this appears to many to be a statue, however, there were no statues at this particular cemetery. Some pillars were there but mostly Tombstones. Absolutely nothing shaped like a man or woman. Also, towards the bottom and the head of the figure, it seems to be transparent or fading. It seems as though she is praying as her arms are folded, you can see part of her elbow on the left hand side of the figure. This cemetery is full of more than just spirits. It does have a very powerful energy that one has to pay attention to. There definitely is a porthole to another world there. As soon as I saw her picture I knew what cemetery she was at. A must visit for all.